Exciting developments are offered by the European aftermarket for car parts in 2015 and 2016. 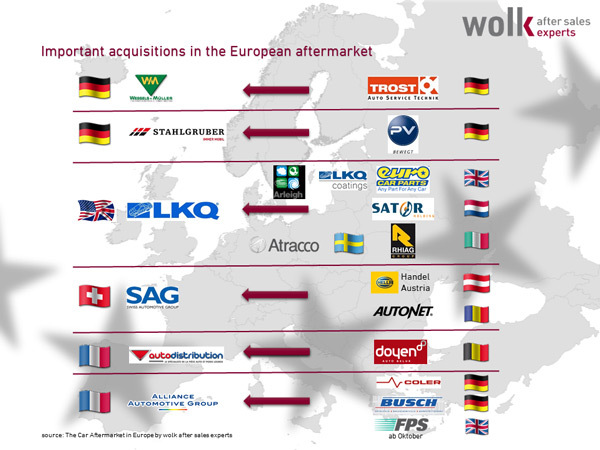 This is how the analysts of wolk after sales experts summarize their annual "The Car Aftermarket in Europe 2015". In 2015 there were 48 parts wholesalers with more than 100 million euros in sales in Europe, one more than in the previous year, eight of them coming from Germany. Overall, the number of parts wholesalers decreased slightly, as did the number of workshops in the 35 countries surveyed. On average, the European car drivers spent 385 euros on car parts 2014. 478 euros invested the drivers in the D.A.CH region, which is a euro less than the year before. Numerous acquisitions in the wholesale car trade marked the year 2015 and the beginning of 2016 in the European IAM. The acquisition of the Romanian company Autonet was announced by the Swiss company SAG, and the north American distributor LKQ continued its shopping trip in Europe with the acquisition of the Italian company Rhiag. The company Alliance Automotive Group acquired the German parts wholesaler Coler (VmA) and Busch (Select) Group. With the Rhiag acquisition, LKQ takes over the unchallenged top position of the car parts distributors in Europe. An end to takeovers and the concentration on the car market in Europe cannot be foreseen so far. However, after every acquisition comes the forceful act of the organizational integration of the acquired companies. How such a restructuring will prove itself is a different story. But one thing is certain: Only those who carry out a consistent consolidation process in all areas of the company can expect positive synergy results. The large international purchasing cooperations such as ATR, Temot, Groupauto International and AD International were able to maintain their positions in Europe in 2015. The newcomer among the international partnerships NEXUS Automotive International has won many new members, but primarily outside of Europe. The only German members of Nexus Automotive International are ATP Auto-Teile-Pöllath Handels GmbH, which is particularly active in online parts trading, and Schäferbarthold, based in Porta Westfalica. In addition, another international purchasing cooperation with Global One Automotive GmbH from Frankfurt has been getting off the starting blocks since May 2016. ... this is also the view of the analysts of wolk after sales experts, as the new research year is starting again. The latest information on acquisitions confirm the thesis that very exciting times can be expected in the aftermarket for car parts in Europe in 2017. The basis for the report is the after sales ACCESS database by wolk after sales experts, with more than 8,000 covered companies in Europe. The national reports are available separately.